Hey people! 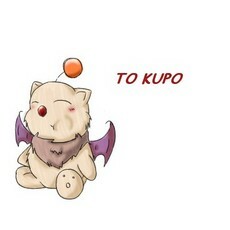 I love moogles or mogs, they are so cute! But anyway, I am 11 I will be 12, september 25, 2006. I'm not very good at drawing, so I just recently deleted all the pic tures that sucked, or I stretched out and made ugly, but my sister (kupo) thinks I am (good at drawing). She's the only reason I'm on this site. hehe. and on yahoo! instant messenger I'm joanna_gartman. My favorite face on the computer is 0.o, it is so cute! But I don't get to use it much, sadly, lol! I'm from Texas and I am in 6th grade. I'm a girl. I hope you could tell. I hate typo's. I love http://legendaryfrog.net, Final fantasy, kingdom hearts, fruits basket, food, and good movies (usually comedy). oh thanx, but the pic isn't all that good. WOW! How long was it? Thanks for the comment. I colored it with my friend's prisma color pencils. I probably should have used better paper though so I could have made my own texture. well it looks really good anyway! nothing, but I'm on Fall break! I'm so happy!